We are pleased to announce that Ryan Johnson, Senior Planner in Alta’s Los Angeles office, has been selected as the Association of Pedestrian and Bicycle Professionals (APBP) 2016 Professional of the Year (private practice category). Ryan demonstrates commitment to the field of active and sustainable transportation both on the job and in his community. He pours his heart and soul into the projects he works on at Alta, knowing that the results are improving the lives of those around him and creating a better place for future generations. Ryan leads by example, while also mentoring new staff at the company. He has helped push Alta into new topic areas and geographical regions, including his native home of Mississippi. Ryan is also a leader in his adopted home of Los Angeles. He co-founded the Southern California chapter of APBP in 2013, and he is also a board member of the local chapter of Young Professionals in Transportation. 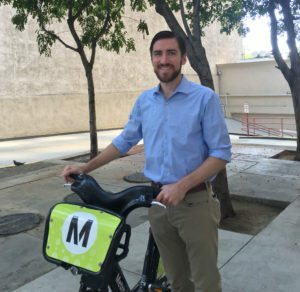 Since 2012, Ryan has served as a representative on the City of Los Angeles Pedestrian Advisory Committee. He volunteers his time with other organizations fighting for more just and healthy streets, including as a certified League Cycling Instructor and as a ride marshal with the Los Angeles County Bicycle Coalition.